Nestled within beautiful Roseville, California, Terraces at Highland Reserve features one, two and three bedrooms luxury apartment homes. All residences feature a gourmet kitchen with granite countertops and stainless steel appliances, high ceilings, air conditioning, a cozy gas fireplace, and a washer & dryer. You will be right at home relaxing on your own private balcony or patio. Also note that private garages are included in rent. Residents can enjoy every bit of the California sun by our resort style pool and spa with cabanas and abundant private lounge chairs. Two full barbecue bars, an old-fashioned wood burning oven and an exquisite outdoor lounge will delight your social experience at any time. Our ideal location is just one block from the Fountains Shopping Center and Roseville Galleria featuring premier shopping and entertainment, and just minutes from I-80 and Highway 65. We are within the prominent Roseville City School District and one mile away from the renowned Catheryn Gates Elementary. Our convenient location means you are also just a five-minute drive to Roseville Bike Trail and a ten minute drive to major employers, such as Sutter, Kaiser Permanente, HP, and the City of Roseville. 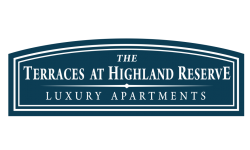 Call or visit today to see what The Terraces at Highland Reserve can offer you!